The past five years in the history of Lockheed Shipbuilding and Construction Company, Seattle, Wash., have been marked by construction of three new submarine tenders for the U.S. Navy and expansion of ship repair capabilities. Concurrent with construction of AS-39 Land-class submarine t e n d e r s , Lockheed Shipbuilding has pursued and captured "lead-in" contracts for a new class of Landing Ship Docks (LSD-41). It is anticipated that construction start of the LSD-41 "Lead Ship" will overlap delivery of the third submarine tender (AS-41) in 1981. 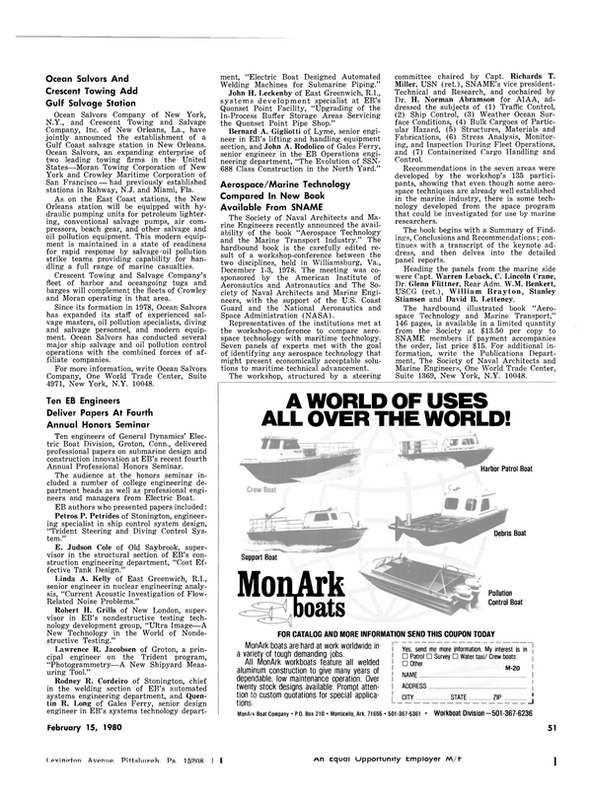 Lockheed's shipyard expects to build LSD-41 and following ships of this class well into the 1980s Through the 70s, Lockheed Shipbuilding's marketing activities were directed primarily by the president's office. Marketing plans for the 80s will require more attention and have prompted the promotion of John N.
Watt to a newly established position—director of marketing. Mr. Watt has been program manager of the successful submarine tender program. Mr. Watt received a B.S. degree in engineering from the University of Portland, Portland, Ore., following active duty. He continued graduate studies in naval architecture at the University of Washington, Seattle. In 1952, he joined the Puget Sound Naval Shipyard as a naval architect. At PSNS in 1954, he directed engineering and installation of the first canted deck on a U.S. Navy aircraft carrier. Leaving PSNS in 1955, he developed shipboard and submarine fleet ballistic missile support systems for Chrysler Missile Corporation in Detroit, Mich., until moving to Aerojet General in Sacramento, Calif, in 1957. He held key program and engineering assignments during Aerojet's work on the propulsion system for Polaris missiles. He later was involved in engineering studies of surface effect ships, air cushion vehicles, and amphibious assault craft. He held positions of increasing responsibility, beginning in 1969 in Aerojet General's 100-ton Surface Effect Ship Program through delivery and tests of the craft, serving as deputy program manager in Tacoma, Wash., until joining Lockheed in 1974. Mr. Watt is a past national secretary of the Society of Aerospace Materials and Process Engineers, and a member of the American Society of Naval Engineers. A long-time company veteran in manager and director positions, William A. Woodrow will succeed Mr. Watt as submarine tender program manager. Mr. Woodrow joined Lockheed Shipbuilding and Construction Company in 1956 as a buyer. He progressed through positions of increasing responsibility as director of purchasing and material control, industrial engineering, management control and scheduling, contract administration, production planning and director of new program development. Following World War II, Mr. Woodrow joined the Westinghouse Electric Corporation in Seattle. In 1950, he joined the Puget Sound Naval Shipyard, and in 1953 he transferred to the supervisor of shipbuilding office, Seattle, as a Naval Progressman. Named Civilian Assistant to the Resident Supervisor of Shipbuilding, he assisted in establishing the first Resident's office at the shipyard, then Puget Sound Bridge and Dredging Company. As LSCC's director of new program development, he has headed the teams responding to the Navy's Request for Proposal for the LSD-41 (Landing Ship Dock), T-ARC-7 (Cable Repair Ship) and the proposal for overhaul and repair of the USS Sacramento, AOE-1.